At first glance, home furnishing and solar energy seem to have little in common. But both mean a lot to the Connecticut economy thanks to a furniture store magnate who is building a new brand leader, C-TEC Solar. In the early 1990’s, Gene Rosenberg helped launch Bob’s Discount Furniture, a low price furniture and bedding retailer, and then later building it into one of the nation’s largest furniture retailers. Twenty years later, Rosenberg took a stake in C-TEC Solar, a modest company that installs solar hot water and photovoltaic (PV) systems. While there is still a long way to go before C-TEC reaches the national stage, it’s following a familiar trajectory. “Every six months, our company is a completely different company – twice, three times, four times the size,” said Dale Johnston, C-TEC’s Total Service Manager. It’s easy to see that C-TEC has inherited “the Bob’s Way” of doing business, with a strong emphasis on quality and affordability. In the solar business, installers know their systems have to reliably produce energy whenever the sun is shining, over the course of 20 years or more. C-TEC delivers on quality by installing Enphase Systems that stand up to extreme temperatures, ultraviolet light, and irregularities in the electric grid. Customers don’t have to take C-TEC’s word about Enphase quality, either. They can see it operating in C-TEC’s residential installations all around Connecticut and its commercial projects in Massachusetts. To assure their customers’ system are built to last, C-TEC relies on Enphase technology, because they know high microinverter quality will keep entire systems producing even with module reliability issues. Both C-TEC and Enphase understand how critical unit reliability is to the performance of an overall system, and that is why Enphase microinverters are tested at every stage - from design through manufacturing, through field analysis. 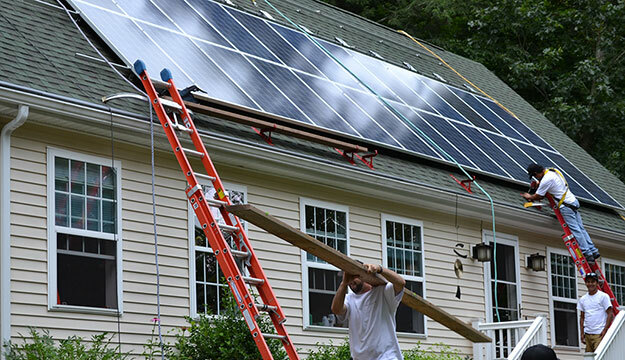 In 2013, C-TEC completed 140 residential solar installations in Connecticut alone. This makes C-TEC the state’s second-largest residential solar installer after SolarCity, Johnston says. Meanwhile, the company has honed its response to service inquiries. With the help of the Enlighten software platform, C-TEC aims to make sure that if a solar panel breaks down but the microinverter keeps working, it will replace the panel without pulling the inverter from the field. The goal for 2014 is to more than double the number of installations as C-TEC looks to branch out into other states. Connecticut is only the starting point, a logical one considering it’s the home of C-TEC Solar. Out of hundreds of Enphase Systems, we’ve had one inverter changed out, and it wasn’t even the inverter’s fault.